At the end of this summer, the world will mark the fifth anniversary of the beginning of the worst financial crisis since the Great Depression. Some commentators will undoubtedly tout the many lessons learned and the progress made towards financial reform. After all, Congress passed the Dodd-Frank Financial Reform bill to lower the risk financial instability and to better deal with its consequences. To end the “Too-Big-Too-Fail” (TBTF) dynamic, regulators were given new authority to monitor and regulate systemically important financial institutions and to liquidate, rather than bailout, those that get in trouble. Markets for complex derivative securities such as credit default swaps were to be made more transparent by requiring more standardization and trading over exchanges. Finally, a new agency, the Consumer Financial Protection Bureau (CFPB), was created to protect consumers from manipulative credit products. Since the financial crisis and Dodd-Frank, the largest banks have only gotten larger. JPMorgan Chase’s London Whale reveals that these firms continue to take very risky bets. Large financial firms appear to continue to benefit from lower credit costs because investors believe that the government will once again come to the rescue should a systemically financial institution get in trouble. Until we are in the midst of the next financial crisis, there is no way of knowing whether these beliefs are wrong. Many of the efforts to regulate derivatives and other financial products have been delayed or diluted. According to the law firm Davis Polk, more than 60% of the regulatory rules required by Dodd-Frank have yet to be finalized – and more than 35% have not even been proposed. The rulemaking of the CFPB is in legal limbo because President Obama was forced by Republican opposition to appoint its director during a very brief Senate recess. The financial regulatory agencies have not been given budgets sufficient to carry out the tasks they were delegated in Dodd-Frank. And despite all of the shortcomings of the reform effort, there is a growing bipartisan movement in the House to repeal much of Dodd-Frank. Why has financial reform unraveled so dramatically? It is because the reform efforts were too focused on the proximate economic causes of the crisis and completely ignored the more fundamental political causes. In our new book, Political Bubbles: Financial Crisis and the Failure of American Democracy, Keith Poole, Howard Rosenthal, and I argue that behind each financial crisis lurks a “political bubble” — a set political biases that foster market behaviors leading to financial instability. Rather than tilting against risky behavior, in political bubbles politicians and regulators aid, abet, and amplify the risks created in financial markets. These biases are deeply embedded in the constellation of ideology, institutions, and interests that define the American political system. We not only trace how a political bubble led to the U.S. deregulatory and monetary policies propped up the asset bubbles that generated the 2008 crisis, but how similar dynamics have played out in the recurrent financial crises in U.S. history. Let’s hope this new political bubble doesn’t pop as violently as the last. How Much Discretion does Obama Have Over Sequester Cuts? As we approach the increasingly likely sequestration cuts, a debate is emerging over exactly how much discretion the President and his Office of Management and Budget (OMB) have over how the cuts are applied. Not surprising, this question has a partisan dimension. For example, in a sequestration FAQ released by House Budget Committee Democrats the answer is “almost none” while Republicans and conservatives are suggesting that Obama has a lot of discretion over how to apply the cuts. Like many things, the answer is somewhere between the partisan extremes. It is true that the sequester is to be applied at the level of the budget account rather than the agency or program. This of course limits the ability of the OMB to shift monies around in response to the mandated cuts. Of the 897 accounts subject to sequester (Social Security, Medicare, and some Defense personnel accounts are exempt), some are quite small and targeted to specific activities. Those activities will clearly face the full brunt of the cuts. But some accounts are huge. For example, the National Institutes of Health has one $35 billion account that consolidates 25 different activities. So OMB will have lots of discretion in managing those cuts. Another source of discretion is that “all agencies will continue to have their existing transfer authority with the limitations that are specific to each agency.” In other words if agencies were allowed to shift money between accounts before, that authority would not be affected by the sequester. So some agencies will have the ability to cut less in some areas and more in others. Other pieces of evidence suggesting that the OMB plans to exercise more discretion than revealed in its September 14 sequester report is that it has more or less issued a gag order against agency officials from talking about the effects of sequestration cuts. The stakes of the political debate are heightened precisely because the extent of presidential and OMB discretion is not very transparent. For example, the president can say that the sequestration will force him to furlough air traffic controllers and Transportation Security agents, but it will be very hard to determine whether or not those cuts were inevitable. Thus, we should expect a nice round of blame-game politics where Republicans charge that president has politically manipulated the cuts to make the public (especially those in bluish Republican congressional districts) feel all the pain. And the Republicans might be right, but they’ll have a tough time proving it. Undoubtedly, the political discussions in coming days ahead will focus on the question of whether the winner of today’s presidential election will have a “mandate” to move the country in his preferred direction. The idea of a mandate is another one of those ideas that are much more popular among the press corps and pundits than it is among political scientists. The data simply do not support the idea that presidents who win with large electoral majorities are able to translate that support into legislative victories. David Mayhew’s recent book Partisan Balance provides some new data with which to look at the question of mandates. His data include all of the major presidential requests from the first two years of a presidential term from Harry Truman to the second term of Bush 43. From these data, he can then tally up “wins” (Congress passes what the president wants) and “losses” (Congress does not pass the requested legislation). Moreover, to take into account the fact that not all requests are equal, he weights each outcome by the importance of the request to president who issued it. From these data, we can check to see whether presidents who won by large margins had better won-loss records (weighted by importance). 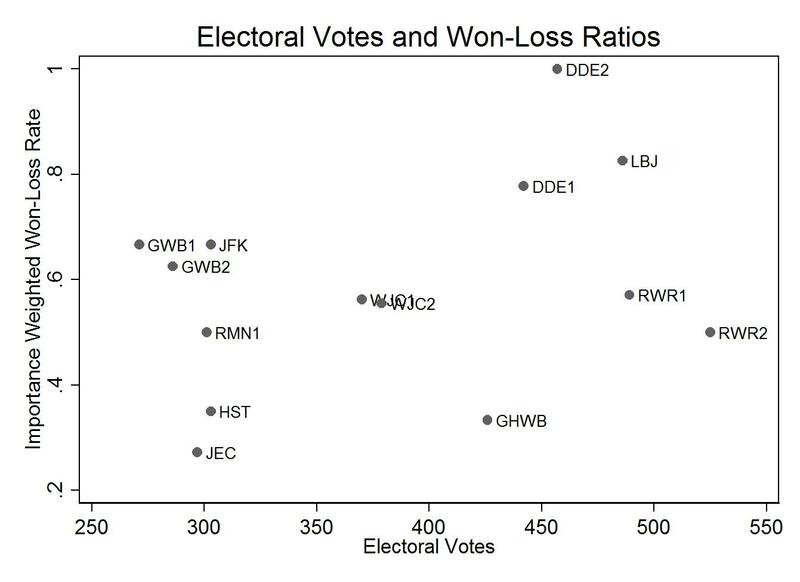 The figure below plots Mayhew’s success rate against the number of electoral votes won by each president. That correlation is zero to three decimal places. Now one might quibble about the inclusion of the Watergate-plagued second Nixon term. Even if that observation were dropped, there would still be no statistically or substantively significant relationship (and one could as easily argue for the elimination of the second Eisenhower term where Ike batted 1.000 but only made one request). The story looks little different is we examine the total wins rather than the won-loss ratio. Here LBJ looks like an outlier. 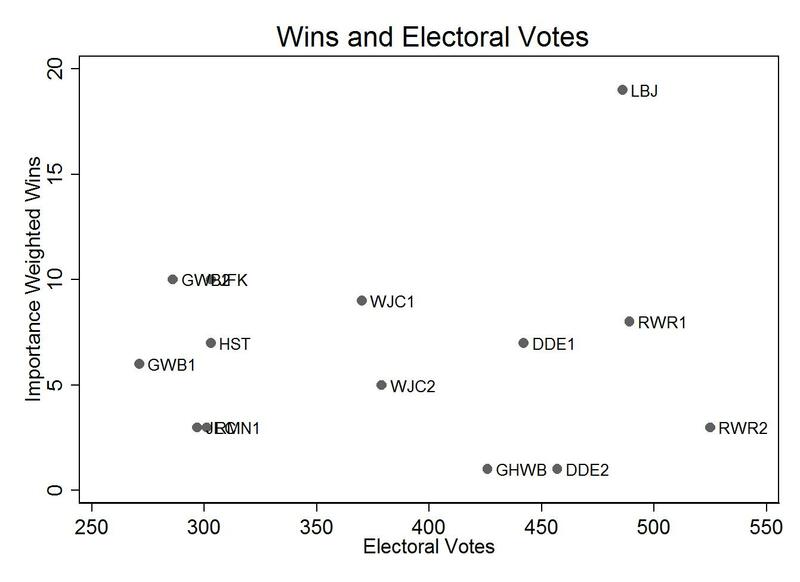 Apart from his success following his landslide victory over Goldwater, there is significant negative relationship between wins and electoral votes. Even when I control for divided party control, the results are the same. Winning big is no more valuable than winning ugly. Although President Obama is not included in Mayhew’s dataset, his experience does not deviate from the pattern. Despite a relatively modest 365 electoral votes, he had major legislative victories on the stimulus package, health care reform, and financial reform. So while there are many legitimate worries about whether the winner of today’s election can have a major impact on our nation’s problems, size (of his victory) does not matter. On May 9, the House of Representatives adopted a provision that would preclude the National Science Foundation (NSF) from supporting research in the field of political science. We believe the important public benefits of this research and the critical role played by the NSF’s annual contribution of about $11m per year to political science research. The mission of the NSF is “to promote the progress of science; to advance the national health, prosperity, and welfare; and to secure the national defense”—the same concerns that guide members of Congress. Since its creation in 1965, the NSF’s political science program has made substantial contributions to all of these key concerns. In recent years, the NSF has funded research on some of our leading security issues: What are the factors that lead to international conflict? What are the causes of terrorism? What are the causes of civil war and state failure? Is nuclear proliferation stoppable? Do economic sanctions work? The NSF has also supported political science research directly related to national prosperity. What are the political factors that lead to excessive spending by state or national governments, or to economic growth, high levels of unemployment or high levels of inflation? How do political factors contribute to trade wars, migration or citizen unrest and violence? What are the characteristics of governments that make them more or less attractive for direct investment by firms? What can be done to make the government more accountable and efficient? NSF-funded political science research has also enhanced national welfare by enriching our understanding of American civic life and democracy. Who votes and why? How can the government better engage and respond to citizens? How can the mechanics of our democracy be improved to better represent citizens’ wishes and desires? In the floor debate on the defunding amendment, the political science program was criticized because a large proportion of its grants go to a small number of universities, but in fact current recipients of NSF political science funding are from 81 different institutions. Just as importantly, the users of the findings work in hundreds of institutions—at colleges and universities, but also in government agencies, think tanks, news organizations, and citizens’ groups. 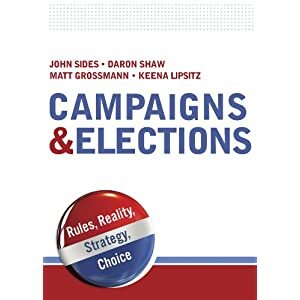 One example is the American National Election Study which has provided data on American elections to thousands of researchers, journalists and policymakers. Another common objection to political science research is that similar research is conducted by journalists, consultants and policy analysts without public support. This other work is important, but much of it depends on political science research to apply the principles of scientific inquiry to the subject of politics to produce the data and scientific analysis that become the raw material that others then interpret. Journalists may ask who is going to win the next election, but a political scientist asks about the factors that drive voter choice and electoral outcomes. A policy analyst may ask how quickly U.S. troops can be drawn down in Afghanistan, but a political scientist wants to know what factors contribute most to successful counterinsurgency strategies. The answers to the specific questions of the journalist and analyst are ultimately based on the more comprehensive perspective that the political scientist brings. We believe that every dollar of federal funding should be seriously scrutinized. The NSF political science program has been committed to the same standards of rigorous, evidence-based scholarship as have the rest of the foundation’s programs. The work it has supported has made major contributions to our understanding of America’s democracy and its place in the world. The research has promoted understanding on vital issues important to Congress, including national security, economic prosperity, and the health of American civic life. We deeply appreciate the generous support provided by Congress for NSF-funded political science research in previous budgets, and we strongly encourage that support to continue. 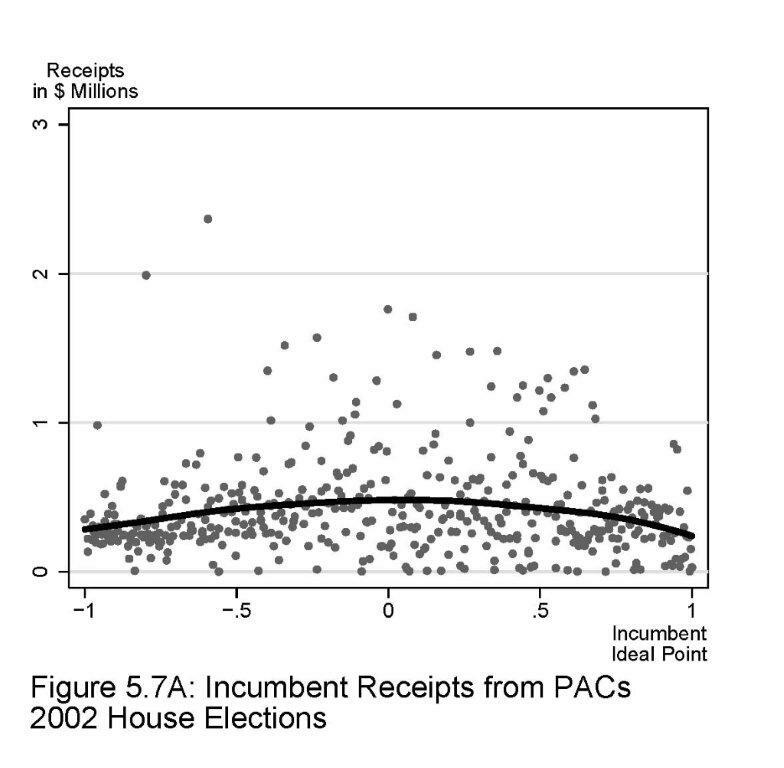 Larry Lessig, Ezra Klein, and an anonymous Economist writer have been debating the relative importance of campaign spending and gerrymandering on partisan polarization. Unfortunately, the exchange is fairly heavy on conjecture and lighter on evidence. Because these are topics on which I have written a bit, I thought I might provide a few pieces of the missing data. The most important piece of evidence for this claim is that polarization in the United States Senate follows a very similar trajectory with polarization in the House, and the Senate has not been subject to gerrymandering since the Dakotas were split in the 1890s. While some have suggested that gerrymandering-induced House polarization generated Senate polarization, the evidence is weak that House polarization causes Senate polarization or that gerrymandering has polarized the House. I have written extensively on that last point. The gist of the argument against gerrymandering is that polarization in its modern incarnation is primarily a result of the difference in the way Democrats and Republicans represent otherwise similar districts. I call this the divergence effect. For example, the gap between Democrats and Republicans who represent 50-50 partisan districts has grown. Polarization is not the result, as the gerrymandering hypothesis would have it, of Democrats representing increasingly liberal districts and Republicans representing conservative districts. I call such an effect sorting. The figures below drawn from my published work illustrate this feature. 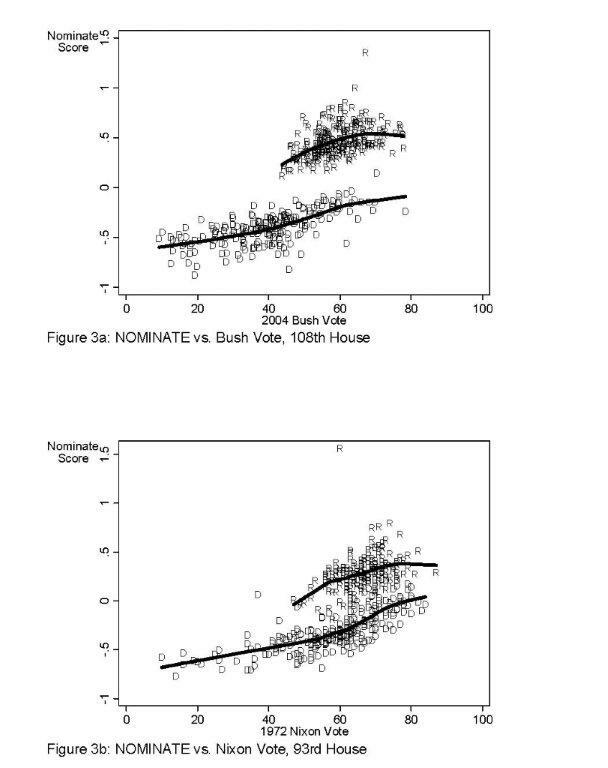 The figures plot a common measure of congressional ideology (the DW-NOMINATE score) against the district vote for the Republican presidential candidate (a commonly used proxy for district partisanship). As one can see, the main difference between the parties in the DW-NOMINATE scale is the gap between the parties at each value of the presidential vote (the distance between the smoothing lines). This gap reflects divergence. Second, note that between 1970s and the 2000s, the divergence between the two lines has grown markedly. The sorting effect is not as strong. There has been an increase in Democrats representing very liberal districts, but this has been primarily confined to urban and majority-minority districts – those that are least susceptible to the partisan gerrymandering that is alleged to have caused polarization. 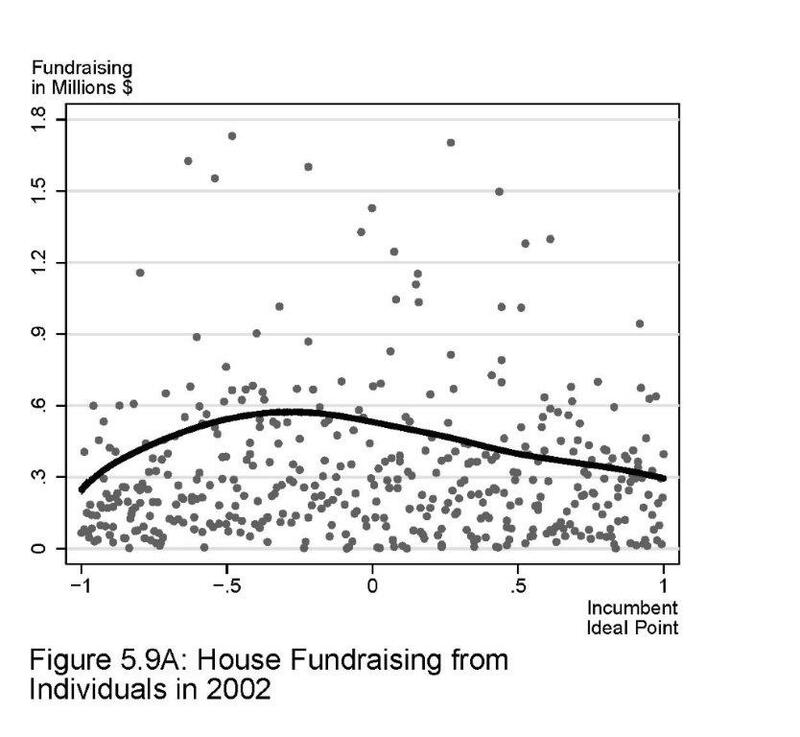 As Boris Shor and I have recently documented, divergence is a much more important source of polarization than is sorting within state legislatures as well. More directly, Keith Poole, Howard Rosenthal, and I conducted a very large number of simulations where we constructed congressional districts under neutral districting procedures and predicted the level of polarization for each simulation. These simulations produce polarization as larger or larger than that we observe in the real data without recourse to gerrymandering. Once one accounts for the divergence effect and inter-state differences, there is almost nothing left to explain. This fact is also consistent with the figure from 2004 above. Note that the estimated smoothing lines are reasonably flat. So on average Republicans from districts with a 50% Bush vote are only slightly more moderate that those with a 70% Bush vote. Yes, Democrats representing districts with 20% Bush vote are considerably more liberal than those with 50%, but again, the 20% districts are primarily minority districts. A more reasonable comparison is 30% versus 50% districts where the average difference is quite small. In sum, the effects of the competitiveness or the partisan composition on a member’s ideological position pale in comparison to the effect of the member’s party. While these data show that over all extremists are only slight beneficiaries of safer, more partisan seats, Tom Brunell and Justin Buchler provide evidence for a stronger claim that members from competitive seats do not pursue positions closer to those of their constituents than do those from less competitive seats. Summary: Gerrymandering, polarization, and the excesses of the campaign finance systems are clearly areas of concern for reformers. But not all bad things gotogether. A famous map by Charles Joseph Minard illustrates the plight of Napoleon’s Army during the 1812 invasion of Russia. At each point of the map, the strength of Napoleon’s army is depicted by the width of a bar showing the movement of Napoleon’s troops. At the beginning of the campaign, this bar is several inches thick, but it steadily narrows at Napoleon reaches Moscow. During his retreat during the harsh winter, the bar narrows dramatically. By the time the French Army exits Russia, the line is the width of a pen stroke. Such a map may now be appropriate to representing the size of the Senate’s moderate contingent. With Oylmpia Snowe’s announced retirement, it appears that the moderates may now have turned the corner at Moscow and are headed into a winter retreat of oblivion. In hindsight, it is easy to see that this was an endangered group. With perhaps the exceptions of Specter and DeWine, they were all Democrats representing heavily Republican states or vice versa. Nevertheless, the size of the group (if not its individual members) held up reasonably well over the decade. The 111th Senate (2009-2010) had ten moderates. The group had been reinforced by the Blanch Lincoln, Evan Bayh, Scott Brown, George Voinovich, Joe Manchin to offset the departures of Breaux, Chafee, DeWine, Jeffords, Miller, and Smith. But it appears that the Russian winter has set in. Bayh and Voinovich retired before the 2010 elections, and their seats were taken by conservative Republicans. Specter and Lincoln were defeated for reelection. These seats also went to conservatives. Nelson is joining Snowe in retirement. It is expected that Nelson’s seat will be won by conservative Republican or the liberal former Senator Bob Kerrey. Snowe’s seat will almost certainly be won by a liberal Democrat. Brown is currently fighting for reelection in a high profile campaign against the liberal hero Elizabeth Warren. If he loses and no new moderates are elected, the moderate battalion will be reduced to Baucus, Collins, and Manchin. Although my cutoff at +/-.2 is somewhat arbitrary, the story would not change much if I expanded the window. Of the near misses, Jim Webb is retiring and Richard Lugar is in a tough primary battle. The collapse of his army had dire consequences for Napoleon’s regime. I hope the same will not be true of the Senate following the rout of the moderates. Almost fifteen years ago, Rose Razaghian and I wrote a paper that examined the underlying causes of increasing delays in the confirmation of executive branch appoints (not surprisingly, partisan polarization was the main culprit). Recess appointments did not quite fit into our framework as we focused on the time between nomination and Senate confirmation. Fortunately, at the time, recess appointments were rare enough and for positions insignificant enough that we could ignore them and still publish the paper in a good journal. I doubt that is the case anymore. Recess appointments are increasingly common and are used for much higher level positions. If one were to update the work I did with Razaghian, no self-respecting editor would let the authors treat recess appointments as glibly as we did. As things have evolved over the past fifteen years, there is nothing unusual in that President Obama used the power to make recess appointments to seat Richard Cordray as head of the Consumer Financial Protection Board (CFPB) and three commissioners on the National Labor Relations Board (NLRB). But his expansive interpretation of the recess appointment power does break some new ground. On provisions of the Constitution that were little debated, interpreting intent is always a little bit tricky. But the most credible interpretation is that the founder’s inserted the clause to deal with the expectation that the Senate would be in session but a few months a year. Until the 1930s, the Senate would convene in March, confirm appointees until April, and then disappear until November. Clearly, the president needed some way of fill positions that came about over the summer. In the dataset I compiled with Razaghian, almost all the recess appointees received their appointments in the summer and were then confirmed in November. Of course, there were exceptions, and these exceptions are precisely those that presidential legal advisors have used to expand the power by insisting its application to much shorter intra-session recesses. President Obama’s latest appointments are just the latest manifestation of stretching that power well beyond anything the Founder’s might have imagined. Indeed, there is a good debate to be had as to whether the Senate is in recess at all. The Constitution requires the concurrence of both houses for a recess greater than three days. Anticipating the possibility of recess appointments, the Republican-led House did not allow a recess. Consequently, both chambers gaveled in and immediately gaveled out in order to remain “in session.” The president’s position is that these procedures were a “scam” since there was never any intention of conducting legislative business. Perhaps. But consider the reaction had George Bush declared this procedure a scam and made major recess appointments when it was used against him at the end of his term. The NLRB appointments raise a few additional issues. The Cordray appointment was a case where a nominee had gone through a thorough Senate vetting, received a positive committee report, and obtained 53 votes on a cloture motion. Two of the NLRB nominations were made in the closing days of the last Senate term despite the fact that there has been two openings on the Board since August and the third opening was predestined by an expiration of, yes, a recess appointment. So the Senate had no opportunity to advise less consent. The administration position is that the Republicans would have surely obstructed. But in my mind, there is a huge difference in aggressively using the recess power because the Republicans had obstructed and using because they are expected to obstruct. Of course, the Senate is not blameless in all of this. The inability and unwillingness of the chamber to curb its obstructionist excesses have forced presidents to circumvent it wherever possible. Ironically, while the Democrats were in high dungeon about Republican obstruction, the New York Times reported that Senator Bob Menendez was blocking a well-qualified appeals court nominee because he has a grudge against her husband. As long as this sort of craziness continues, who can blame a president for seeking an easy way out even if it depends on a tortured interpretation of the Constitution? The confirmation process is clearly broken (and this is not exactly news). But there may be a silver lining. Now that the limitations on the recess appointment power have been whittled away to nothing, it might finally be in interest of the Senate minority to cut a deal that combines curbs on obstruction with the restoration of reasonable limits on the recess appointment.